Five-time Formula 1 world champion Lewis Hamilton had to be convinced to “go a bit slower” in his Yamaha Superbike track test at Jerez, says rider Michael van der Mark. 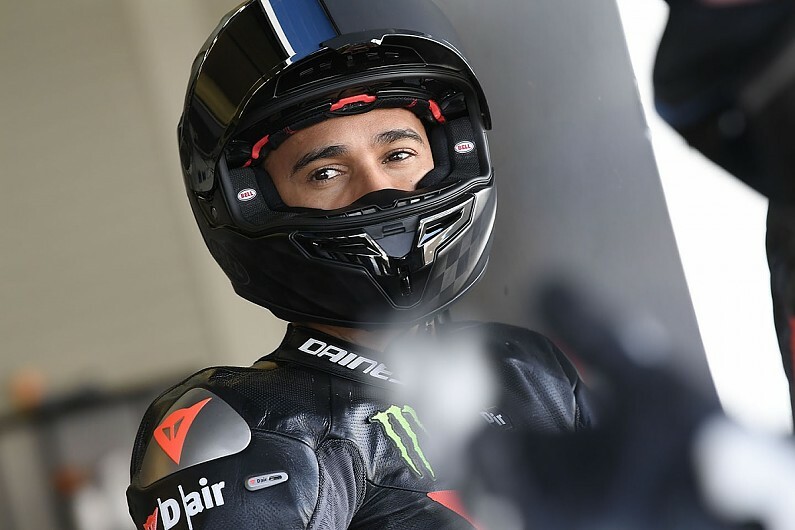 Hamilton rode a black Yamaha YZF-R1 bike alongside works riders van der Mark and Alex Lowes earlier this month and the track test was overseen by the Crescent team that operates Yamaha’s World Superbikes outfit. The Mercedes F1 driver had an earlier outing with LCR Honda MotoGP rider Cal Crutchlow and has previously professed his love of the category. But van der Mark told Autosport that Hamilton’s lack of riding style meant he had to be encouraged to slow down. “Lewis already did two track days on his bike [before] and the people of his team were a little bit concerned because of his speed,” he said. “He was very fast but he didn’t have a riding style. He had lots of lean angle, so the initiative came a bit from his team that he’d get a few tips from professionals. “During the first day I was alone with Lewis and on the second day my team-mate Alex Lowes joined us. “On the first day I’ve was only trying to make him go a bit slower. Van der Mark added that Hamilton’s work rate impressed him. “Even if it’s just for fun, he was so motivated to learn,” he said. “He asked loads of things and that was special to see. “You see it’s fun for him, but he goes all the way. The Yamaha rider did shied away from stating how competitive Hamilton would be if he was to make a move into bike racing. Van der Mark was third in this year’s WSBK standings and said: “You see he’s [Hamilton] not afraid at all. “You also see that he doesn’t have any doubt, you see a lot of riders who have a little doubt, but he’s going all the way if he decides to do it that way. “That’s the same in a car, that’s just his natural talent. He can ride a bike for sure – I don’t know how much faster he can go.